Tripura is the next state we are stepping into. Tripura is the 3rd smallest state in the country.It was a princely state during the British Rule and later was joined to India in 1949.It is the remotest of the 7 North Eastern States. Tripura lies in a very geographically disadvantaged place with its only connection to the outside world being to NH 44.Due to its geographical location,this state is backward in economic progression and is plagued by poverty and unemployment. Tripura cuisine is predominantly a non vegetarian one .It has the influence to Bengali cuisine to a larger extent and a touch of Chinese cuisine .One of the most important ingredient in their kitchen is Berma which is dried fermented fish. Rice ,fish and vegetables are the staples here.Other types of meat are also consumed. Bamboo shoots and local herbs are also used in their dishes.Vegetable oil and mustard oil is used for cooking .And many of the Tripuri dishes are cooked without oil and therefore are quite healthy. I read that thought the Tripuri people are adapting and changing their culture to suit the modern world, they have still retained their culinary heritage. From Tripura, we have this chutney - Mosdeng Serma .The characteristic taste of this chutney is probably from the Berma[dried and fermented fish] that is used. I skipped that made a vegetarian version of this chutney. This is similar to the ones we make regularly but the difference is in the method. Hubby and MIL loved it as it was really spicy. I didn't even touch it! Mix the chili powder in 1/4 cup of water and keep aside.Heat oil in a pan and is soft.Put in the onion and garlic and saute till onion is light brown.Add the chili powder mixture and be sure to stay away from the pan and to open the windows and turn on the exhaust. 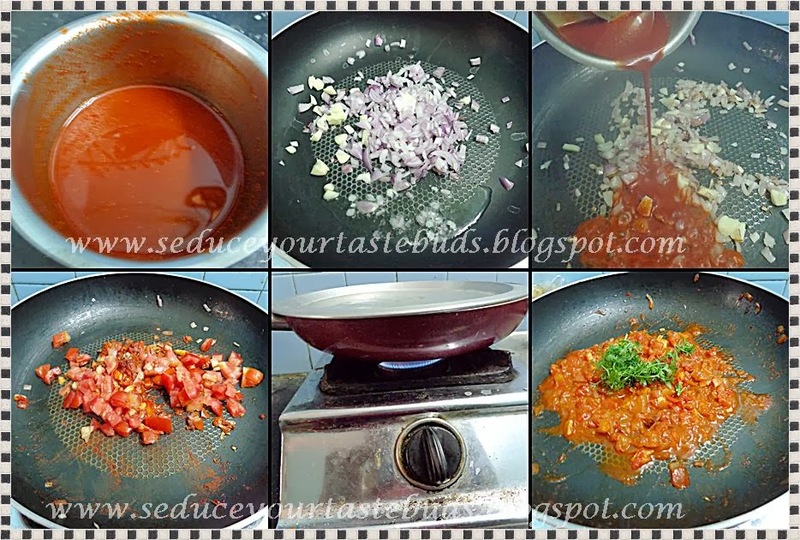 Cook for a while till the chili paste thickens and then add tomatoes.Mix well and cover and cook till the tomato is soft and mushy.Add the coriander leaves ,mix and remove from heat.